Juan Rodriguez, 40, Roger Bourgoine, 40, and Charles Manchester, 42, are accused of driving from Miami to Martin County to steal personal watercraft and boat motors from Legacy Marine. 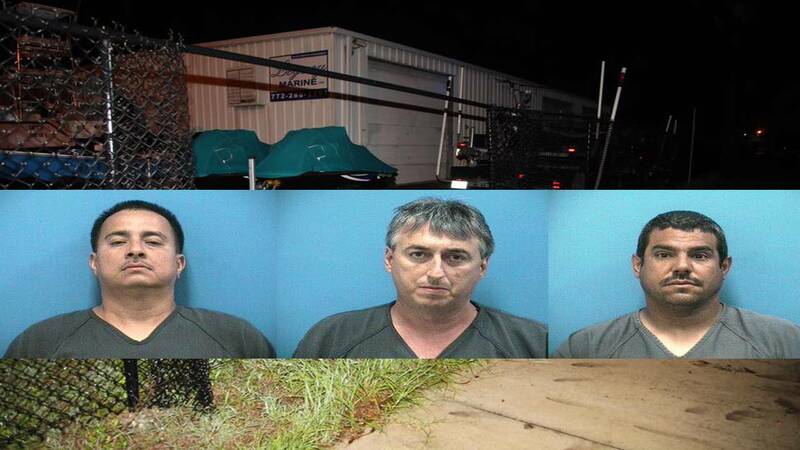 STUART, Fla. - Three Miami men were arrested Monday after they drove to Martin County to steal personal watercraft and boat motors from a marine store, according to the Martin County Sheriff's Office. Juan Rodriguez, 40, Roger Bourgoine, 40, and Charles Manchester, 42, were booked into the Martin County Jail on charges of burglary and grand theft. According to a post on the Martin County Sheriff's Office Facebook page, a concerned citizen called deputies after noticing suspicious activity outside Legacy Marine in Stuart. A deputy reviewed surveillance video in the area and saw what appeared to be a group of men casing the business and using a lookout vehicle. The men returned several hours later, cut a hole in the fence and tried to steal two Jet Skis and some boat motors, but deputies were waiting for them. The suspects tried to run but were quickly apprehended. Deputies said the men admitted to driving to Martin County to commit the crimes.